Since joining the Fiji Revenue and Customs Service (FRCS) in 2017, Mohit Kapadia has made it his aim to be introduce innovative ideas to enhance the organisation’s systems. 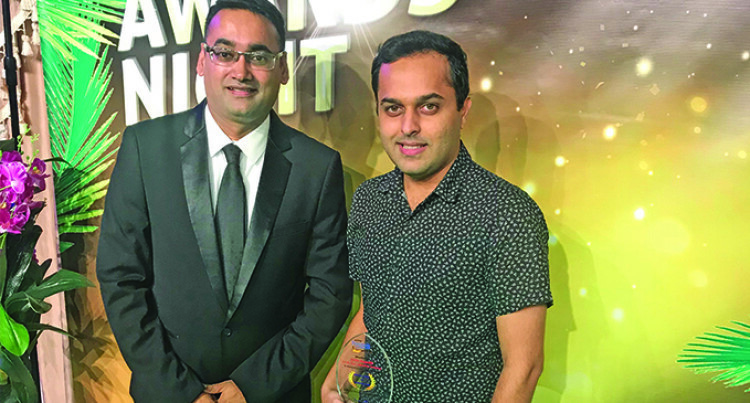 Mr Kapadia was awarded the innovation award past Friday during the inaugural Fiji Revenue and Customs Service awards night at the Central Cuisine Restaurant and Events Centre – Laucala Bay (Sports City Complex). “I received this innovation award today, in regards to the new reporting services system we have rolled out, where the management team get real time reporting. Previously, what happened was management used to request for reports and it would take one to two weeks to get the report out of the system. He said he was really glad that FRCS recognised him and the work he does, especially when the organisation is a Government statutory body, it’s important that Government lead the way in Fiji. He said there are other innovative projects in the pipeline. The 31-year-old was born in Fiji but moved to New Zealand, where he studied software engineering. Now he is back and wants to offer his services and skills that he had learnt from innovative companies in New Zealand to the people. “This is my first job in Fiji, I have lived in New Zealand, over there I have worked with innovative people so I have learnt a lot.